The Southern California locations where Agents of S.H.I.E.L.D." is filmed. 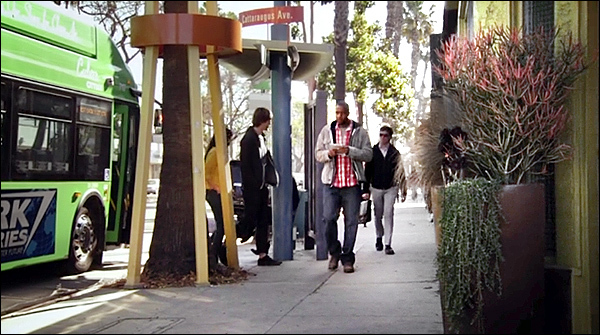 In Episode 1, we see Mike Peterson walking down the street, past a bus stop, reading the want-ads. of Cattarugus Ave. Mike Peterson is walking west, towards Cattarugus. That bus bench is real. And that odd yellow & orange thing wrapping around the palm tree? Well, Culver City is best known for being the home of MGM Studios, where "The Wizard of Oz"
less than two miles northeast of this corner. That yellow & orange tree-surround you see is actually part of a salute to that movie history. each celebrating a movie which was filmed in Culver City. This one salutes a 1957 Elvis Presley musical: "Jailhouse Rock". Here is a Google StreetView of that corner.